I know I have unsightly brows now but I am guessing there's worst brows out there or someone has lost their tweezers! If you have read my Benefit Party post you'll know that I have two (2) complimentary brow arch service cards worth Rm55 each in my hand now, expiring on 15th May,2010. Without further delay, I'm going to give it to two (2) followers who could show me why they need a brow makeover! I will leave the cards at Benefit Cosmetics Parkson Pavilion for the lucky two followers or have them courier to you asap (whichever way the best). 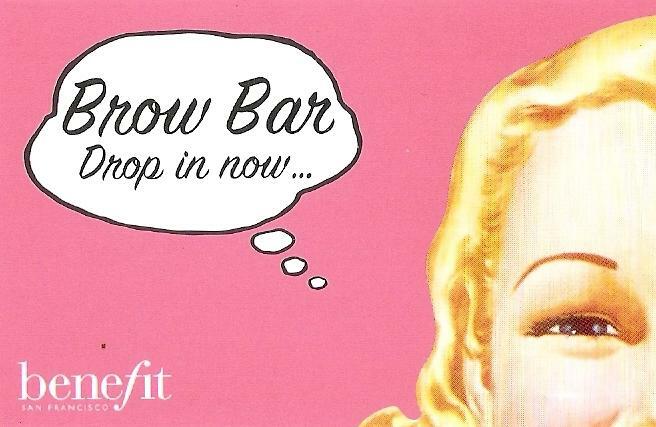 To avoid any disappointment, I have already booked two brow bar sessions on 15th May, 2010 at 2pm. The lucky winners may change the time if there's other slot available. (Left) Before: These brows need some work. (Right) After: The final result: neat, arched brows that open up the eyes. How am I going to pick the two winners? snap a picture of your eye brow and tell me why u need a brow makeover! (the picture will appear in this post) Hurry! The giveaway starts today and ends well Monday? remember Benefit Cosmetics Parkson Pavilion only! Just e-mail tammylci@gmail.com your photos or you can also blog about it. Don't forget to give me your follower id! (check the left side of this blog panel for the follower box). 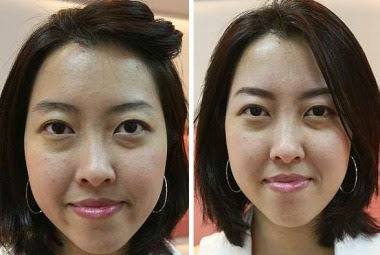 1: To show how the brows will eventually look, the brow artist draws the ideal shape. Once the customer’s satisfied, the marks are wiped off. 2: Benefit’s ‘secret recipe’ wax in its warming container. 3: Stray hairs on the bridge of the nose are tackled first. 4: Cloth is smoothed onto the waxed area, then quickly ripped off. A little sting, and unsightly hair is gone. 5: Applying wax to the delicate eyelid area has to be a gentle process. 6: Once the waxing is done, all traces of wax is removed with a cleanser called – what else! – Wax Off. 7: A cooling gel is applied to soothe the waxed areas. 8: Tweezing out any stray hairs to ‘fine tune’ the shape. 9: ‘Some Kind of Gorgeous’ powder eye colour is applied to tone down the redness of the skin. 10: The final touch: the brow is extended, if necessary, with a brow liner. where should we post the photo? by email? FB? FB to me also can, if u have my FB. ooooo.... gotta show our unghastly brow ah??? hahaha.... okok.. where to send da pic? Dear Sue, yes! to be fair, let's save the err.. ones which needs to be rescue first. Or those who suffer from ugly brows shapes..
wah nice so sad its far from me. i nvr done face hair wax before, does it painfull? Do we require to do patch test a day before doing the wax? Will...hmm...the hair will become more corsy (Kasar) from our existing hair in future? 2. nope your hairs won't become coarser as the hairs are pull out of the root. New hair will grow. Coarser hair - shaving. Pain threshold differs from one person to another. My experience was not a painful one but a shocking one as it's my first time having wax done and in a matter of split second, pull off! I did not have time to feel pain, I was very shocked. However even if hair is pluck/wax off, there is a degree of pain to experience, but still depends on the individual again. for full info on the whole experience, this article from The Star newspaper might help. Pictures and procedures included. Sherry: u ah.. :( subang parade near u..
yeah subang parade. near.. jalan kaki.. c c many car pusing balik. lol.. no la.. but seldom go there.. usually now hang out c4 shop groceries haha.. giant.. x go.. lazy as only like S.A one. umm... tesco worst.. x go at all already like half yr.
contest end :D goin to announce the two girls! hey! just wondering since you know best. if there's a place in Pavillion/farenheit 88 that has brazillian waxing services? Heya, hmm.. for waxing services? :) fyi Strip: Ministry of Waxing will be opening it's 4th outlet at Lot 10 (nearby Fahrenheitt/Pav walking distance) I think this week! as I got an invitation to go for their latest wax - strawberry wax. Cool thing about new openings is the high chance of promotions and first trial offers. Hope they have it.